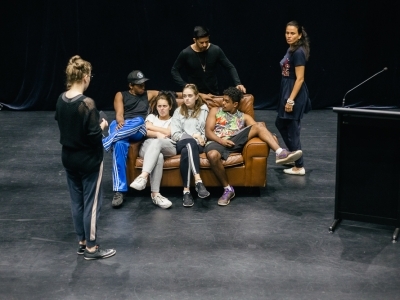 Throughout 2017, Indigenous Scholarship Program participant Jacinta Keefe has documented her group’s journey exploring performance skills, writing for the stage, production and design, as well as their experiences seeing live performances. 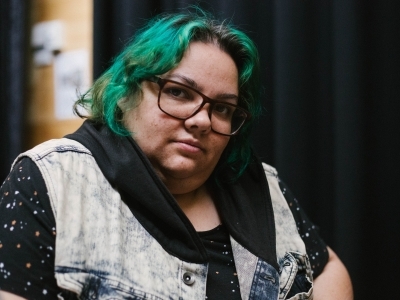 Jacinta, a freelance photographer, production designer and props maker, was one of eight participants in MTC’s 2017 Indigenous Scholarship Program, a one-of-a-kind learning opportunity spanning four intensive weeks across the year. 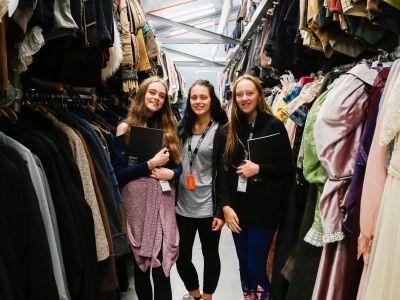 Amelia O’Leary, Shaniqua Lee and Brodi Purtill in the Costume Store at MTC HQ. Starting the week bright and starry eyed, we went on a tour of Melbourne Theatre Company’s production headquarters in Southbank. This included the costumes and props department, where we got to touch and put on various costume pieces. Brodi, Shaniqua and Amelia stopped for a photo amongst the beautiful costumes. It was incredible to see such a variety of clothes ranging from renaissance to the 90s, and beyond! 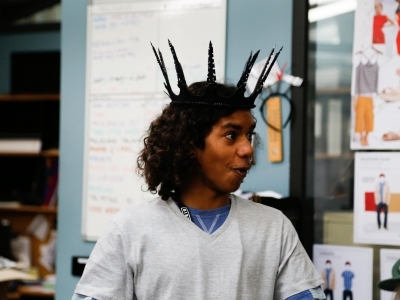 Khan James-Parker wearing a crown in the Wardrobe Department. During our travels, we ventured into the wardrobe department, where we were able to all get a portrait taken with the crown from the promotional image of Macbeth for MTC’s Season 2017 brochure. The crown itself was made from sections of a paper fan, melted with a soldering iron, which wound up being attached to a felt base and painted black. You can tell from Khan’s face how ecstatic we all were to experience this! The group at a smoking ceremony in the Royal Botanic Gardens. Onward to Week 2 in July, which coincided with NAIDOC Week. To celebrate our wonderful culture, we took to the Royal Botanic Gardens with our facilitator Lenka Vanderboom, who graciously had us participate in a variety of activities. 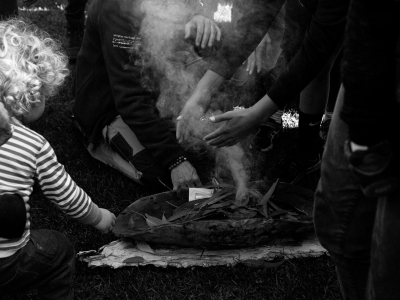 The day began with a Smoking Ceremony and a Welcome to Country as a means of paying our respects, from this we split in to two groups and helped run workshops in the gardens, teaching kids and adults about various traditions. Ochre hand paintings created by the group. In the early afternoon, the boys played digeridoo down by a pond, creating a soundscape, while Amelia and Shaniqua helped crush up ochre to create traditional paintings. 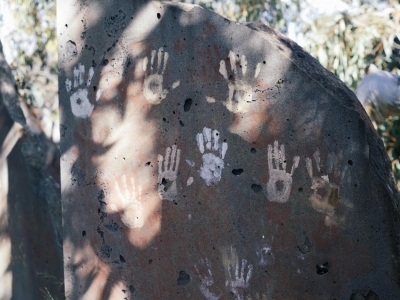 While they were making the ochre paint, some of the kids made handprints on the surrounding rocks, which Brodi lovingly captured. Brodi Purtill and Karin Farrell in the rehearsal studio at MTC HQ. During Week 2, we got to meet various staff from departments across MTC HQ, including Marketing, Graphic Design, Human Resources and even the Artistic Director/CEO. This was so we could learn about what makes HQ work and all the people that keep it running like a well-oiled machine. We also worked on a performance to show all these new people we had met. This was all possible because of the one and only Karin Farrell, the Community Outreach Manager (mum, for all of us during our time at MTC). So here we have a photo of Karin and Brodi, who jokes about stealing her job! Ian Layland and Josh Marshall at JOY Radio Station. Easily one of the coolest experiences of the week, our other facilitator Suri (Sermsah Bin Saad) took us to JOY Radio Station (94.9 FM), where we got to see how a modern-day independent radio station is run, we even got to be on his show, Urban Dreaming! It showcases Indigenous people and community events. 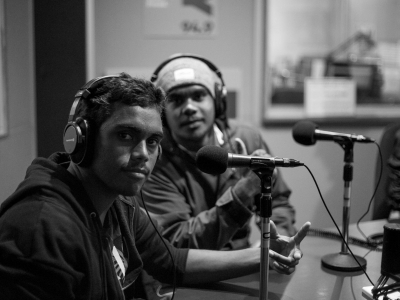 Josh and Ian got more than they bargained for by being interviewed by Suri about their time so far with MTC and the Indigenous Scholarship Program. 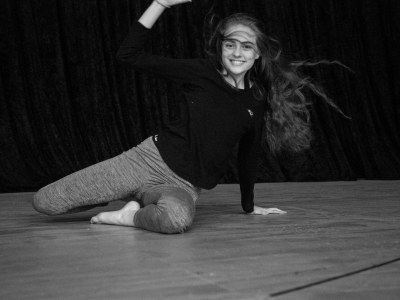 Amelia O’Leary dancing in the rehearsal studio at MTC HQ. September quickly approached us, and we were thrown into Week 3. 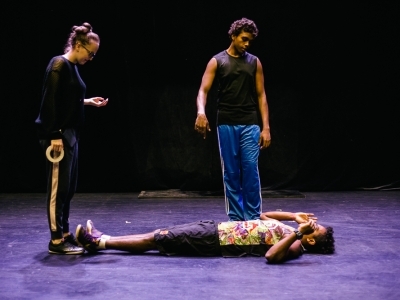 During the early stages of this week, we played with performance and movement to start to get an idea for our final piece, a 20-minute long performance, to play in the Lawler at Southbank Theatre. This is a shot of Amelia showing off some of her fantastic dance moves while we were all warming up for the day. Sermsah Bin Saad (Suri) with Brodi Purtill and Kieran Mounsey in rehearsal. 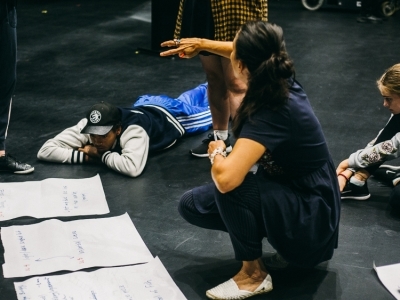 A large part of the week was devoted to devising a plan for our performance, this of course wasn’t without its own obstacles, a big part of this experience is learning to work together. Some heads butted and some tears were shed, but ultimately we managed to sit down and figure something out that would work for all of us, which is the best part of working in a team. Suri was overseeing the dance component, while Brodi was planning story sequencing, and Kieran and myself were covering design and lighting for the performance. Model boxes created by the Indigenous Scholarship Program participants. 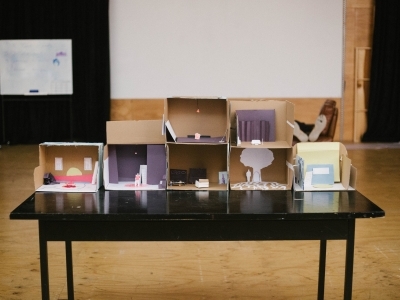 A large part of the design process behind a theatre production is white card models and model making. After meeting and talking with MTC Production Design Coordinator Andrew Bailey, who shared his incredible knowledge with us, we had a chance to create our own fleshed out models of what we think we’ll do for our final performance. Shaniqua Lee creating a model box. 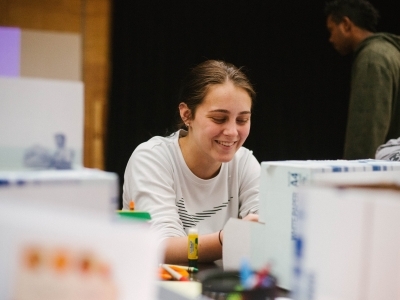 After Andrew Bailey’s talk, we sat around a big table and chatted while making out model boxes, this is Shaniqua working on her model box for our final performance. 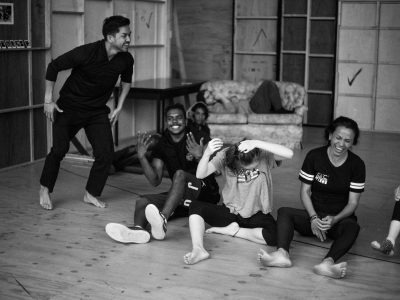 Sermsah Bin Saad, Josh Marshall, Khan James-Parker, Brodi Purtill and Lenka Vanderboom in rehearsal. Not all of Week 3 was spent knuckled down and drawing, we all did various activities to stay active and get in the mood for performing. Lenka and Suri had us do ‘the caterpillar’, where everyone lies down in a row and one lucky person gets to be rolled along the top of everyone almost like a caterpillar! It was a very strange experience, but definitely helped lift the mood and get everyone ready for acting. Sermsah Bin Saad (Suri) and Lenka Vanderboom in the rehearsal studio. 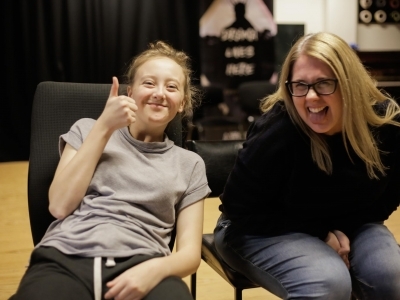 Lenka and Suri, our facilitators, but also our mentors and guides for our time at MTC, have taught us so many things: how to work as a team and to look out for each other; how to care for ourselves when working under pressures; and to ultimately have a good time. Here they are taking us through a game of Zip Zop Zap. Jacinta Keefe in the rehearsal studio. This is me at the end of Week 3, utterly exhausted, having participated in all the activities and helped plan the final show. I took most of the images you see here. I hope to expand my knowledge of Production Design and learn the ins and outs of what makes a theatre performance run smoothly. Dylan Singh (right) leads the group in an acrobatics workshop at MTC HQ. First day into Week 4 and we are right back at it with an acrobatics and clowning workshop with Dylan Singh. 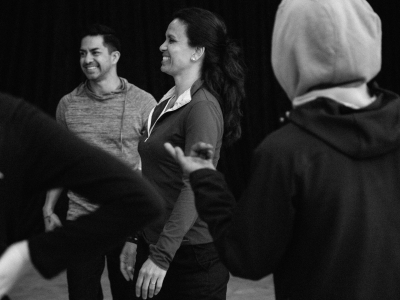 He took us through some basic warm up routines for loosening the body, getting used to moving fluidly, and how to work as a team. In the image above, Dylan is running us through a movement process, where we had to transport someone from point A to B without touching the ground. This ended in us doing all sorts of wacky things, likr lifting someone and rolling them around. Given that our big performance was at the end of the week, it was a great bonding exercise as well. We had to place trust in the people around us, and it set the tone for supporting each other until the end. Lenka Vanderboom facilitates rehearsal at the Lawler. On Tuesday we began the final stages of planning and began rehearsals for our production Darklight. In this picture, Lenka is explaining how limited our time on stage is (20 minutes), and how important it was to make the most of it. Lenka helped us tighten our scenes. 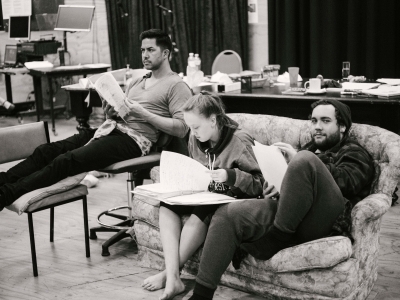 Brodi Purtill, Josh Marshall and Ian Layland in rehearsal at Southbank Theatre. As the week went on, we entered dress rehearsal. Ian and Josh are running through their ‘kangaroo’ scene with some direction and management from our Stage Manager, Brodi. She ensured everyone knew where their places were on stage, what was happening when, and making sure we stuck to our schedule. During this time, I was going over the lighting design for each of the scenes in the show. With Brodi’s help, I was able to tell Tom, the lighting tech, what was going on in each scene and make a cue sheet for the show. Josh Marshall and Lenka Vanderboom at Southbank Theatre. And here we are at the end of our final rehearsal, taking last minute notes and guidance from our facilitators, before we headed backstage for our debut performance! 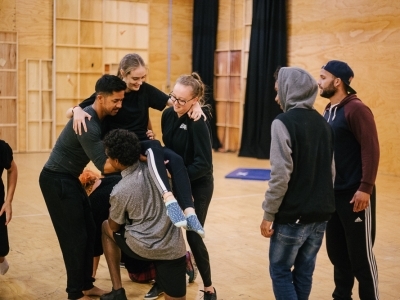 The MTC Indigenous Scholarship Program is supported by Crown Resorts Foundation and the Packer Family Foundation, in partnership with the Wilin Centre for Indigenous Arts and Cultural Development. To learn more about MTC’S Indigenous Scholarship Program, click here.